God was so kind creating nuns so photographers could rejoice. Let’s talk frankly, who doesn’t see in their aesthetics some extremely photogenic creatures? The simplicity of their clothing and colors, mainly black and white, make them especially attractive to anyone with a camera that sees them. History of photography is full of photos where the main character is a nun. Those who know me you know how much I feel attracted to a portrait of a nun. When I was young and some passed next to me, my day was ruined as I consider them bearers of bad luck. Now however I collect them. I love them photographically. As an example you can see the one here that goes with the text. I bought this portrait some months ago. I think it’s a wonderful portrait which is probably one century old, or even older. The photographer was Fernando Valdivieso de Granada (Gran Vía, 2) who in his personal details has written “there’s a lift”; something to take into account when the photographic cabinets where in the rooftops. 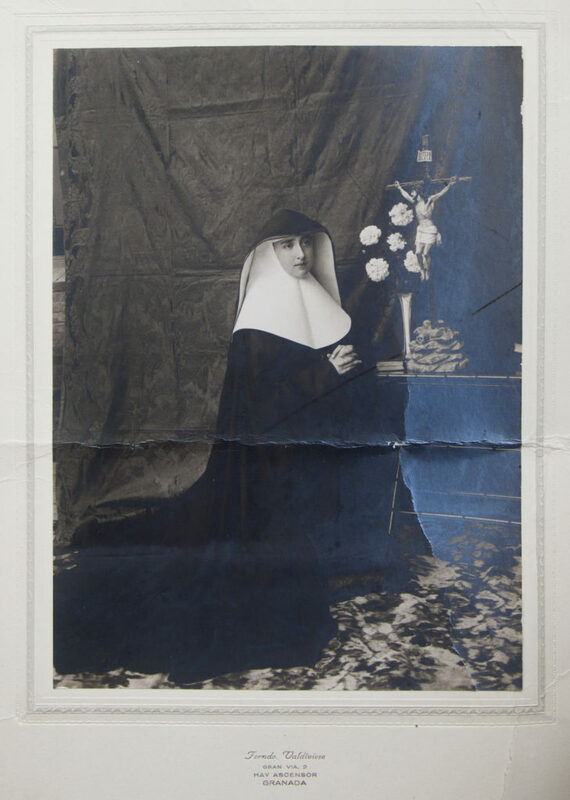 When I bought it on the internet I didn’t realize that the size was quite big (39x27cm); it’s clear that this nun wasn’t a fan of carte de visite. The tragic moment came when I opened the mailbox and I saw the padded envelope cruelly folded and stuck harshly inside. I couldn’t imagine that my beloved nun from Granada was destroyed inside! The postman (or postwoman) struggled hard to make it fit: bending wherever was necessary and pressing hard to make it fit where it couldn’t. The only thing that can extenuate him/her is that he/she was a die-hard republican. My despair when I opened the envelope and discovered the conditions of my nun, after surviving for one century, was immense. In addition to the folds that you can see, if you see it against the light you will see that it even has been torn. A disaster! But well, what is done is done. Even with the damage I think that such a pretty portrait of this nun, made with so much care by our photographer from Granada, deserves to be shown and enjoyed instead of hiding and forgetting it. Checking her china-like face, those gracefully intertwined hands which stand against the darkness of the habit, that habit with its long train so well placed resembling a bride, all the decoration with a balance between austere but cared, the pretty flowers which perfume to the portrait… all in perfect harmony. Even Christ seems charmed unable to avoid staring at our pretty nun. Another detail which I especially like is that in the left side you can see the “trick” of the fake background; it makes me feel closer to the moment when the photographer took this portrait. Nuns are slowly extinguishing; mainly in the small villages. Where I live it’s been a long time without seeing any. I know that in Asilo there are some, but either they rarely go out or when they do we don’t meet. Some weeks ago I was in Girona. Just turning a corner I saw a couple of nuns and I was shocked. They were a beauty: extremely small, both with exactly the same height and body shape; dressed exactly the same, even to the smallest detail; their habits were grey, extremely clean and shiny. They did stand up among the other people in the street! As I couldn’t see coming, as I stumped onto them, I was shocked and probably as stunned as the Christ in Valdivieso’s portrait. I wouldn’t have been more shocked if I had found a couple of aliens. A pleasure first, but frustration afterwards as I didn’t have a camera, and what’s more important, nor the courage to take a photo of them. I hope there’s a new chance. I don’t want to finish this article without giving a lot of thanks to all the Friends from FB for the time that we have been creating a very special “convent” filled with portraits of those beings that are so photogenic, nuns. Photo by Fernando Valdivieso. Gran Vía, 2 de Granada. Particular collection of M. Luz Cámara..